Aug. 1st is the universal birthday for all shelter and rescue dogs. "How old is your dog?" Seems like a simple question, right? But if your rescue dog joined your family as an adult, it can actually be quite tricky. 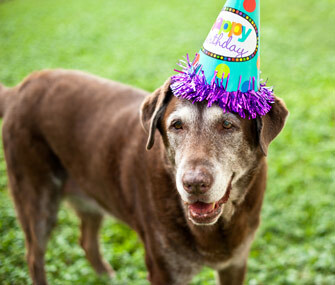 Maybe you know your pup is about 5 years old, but don't know his exact birthday (or even the month), or maybe you just know you've brought a senior dog into your home and whether she's 8 or 10 is anybody's guess. Step it up:Consider contacting the organization ahead of time to see if it has a wishlist or any particular needs. Some groups havecontacts that supply them with food and beds, but they might really need sturdy leashes or plush puppy toys. Since you're giving, you might as well give them things that will be truly helpful! Step it up: These stories aren’t just a boost to the people at the organization, but they can also provide some great publicity via social media. If the organization is fairly social media savvy, you can probably just send your pictures and story over to them with your consent to share. If you have some social media skills, though, you can also offer to handle sharing it for them on their various channels, walk someone there through how to do it themselves or share publicly on your own channels and tag the shelter, providing instructions on how to share what you've posted. If you and your rescue dog are therapy certified, DOGust the 1stwould be a great day to use that skill by visiting a hospital, nursing home or other location you’re cleared to visit. It’s a win-win because you’ll feel good about helping other people, your dog will be happy about spending time with you and overall, it’s beneficial to the pet rescue community when people see you and your pup setting such a stellar example of the great work a shelter dog can do.